The idea of Short Messaging Service (SMS) as an inbound marketing tool may seem strange to some. However, when you make your messages conversational and reflective of your customer’s buyer’s journey, it can be a great tool. 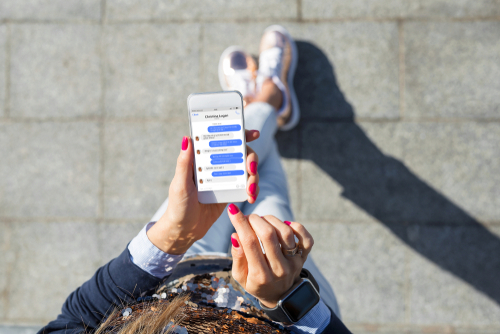 After all, a text is read within 90 seconds of being received and almost 98% of all texts are read - which is no wonder why eight out of ten businesses are already incorporating SMS into their marketing strategies. But how can you use it specifically along the various stages of a buyer’s journey? Continue reading for our advice on how SMS fits in with awareness, consideration, decision, and customer stages your leads face. However, before beginning, be sure only to be sending messages to your contacts and always include an unsubscribe option in your initial message. If you’re sending it to a new contact, you need a written opt-in in your first correspondence. The awareness stage is the beginning of any relationship you have with a potential customer. At this stage, content should focus on your customers’ pain points. You want to provide them with the educational material surrounding those pain points. Present content that shows you acknowledge their struggles in their daily jobs. An introductory text that invites your contact to read your blog or sign up for an email newsletter would fit the appropriate content for this stage. Remember, you’re trying to build credibility with them at this point. But keep in mind not to overtly talk about your brand or product. When considering what content to put in an awareness-stage SMS, think high-level. If you sell enterprise resource planning (ERP) software, try texting a prospect a link to a generalized checklist of things to consider when first exploring ERP options. Also, remember not to bombard them with a lengthy, three-part text (this goes with any of the stages, really). Think of pre-2017 Twitter when crafting your messages. What would you tweet about when trying to make followers aware of your products? At this point, your contact is exploring solutions. So show them you have the best solutions to their problems and pain points. Now is the time to facilitate appropriate research and content that creates an understanding of your products. For this stage, you can text out alerts to sign up for webinars hosted by team members within your company. Natively record and send a short demo video via SMS, inviting your contacts to reply for more. For contacts who’ve shown a good deal of interest, you might encourage them to text back and forth – almost as if you were hosting a live Q&A. When customers reach the decision stage, they’re almost ready to buy and need details to support buying your specific product. Now is the time to give them brand-specific content and help them compare and contrast solutions, vendors, products, and brands. Prove the return on investment by sending them an SMS campaign centered around your case studies. For example, you could text them a quick overview of how a specific product you sell helped a brand similar to yours. Or, try sending them an SMS that features a video with a product review. If appropriate for your business, you could also send them a special offer, discount, or coupon that they can only receive through your SMS campaign. Once you sign a contact as a client, you shouldn’t forget about them. The key to real business growth is getting people to buy again. Who better to target than your current customers? From renewal fees to cross-sells and up-sells, this is a vital stage of the buyers’ journey to keep in mind. SMS is a great way to continue educating your current customers on your products via service alerts, updates, and reminders. A quick text that tells them when a new product release is coming shows dedication to their customer satisfaction. Your team can send other critical information, like maintenance windows, to keep customers informed. For customers who don’t prefer traditional forms of contact, allow them to text questions about a product, or set up a training call via SMS. If you’re not already using SMS in your inbound strategy, consider it. You can cater the messages to align with every stage of your customer's journey – even maintaining a thorough, solid relationship after they’ve signed on. For help with strategies, content ideas, and implementation, contact LyntonWeb today.